Albert Einstein, the genius physicist whose theories changed our ideas of how the universe works, died 55 years ago, on April 18, 1955, of heart failure. He was 76. His funeral and cremation were intensely private affairs, and only one photographer managed to capture the events of that extraordinary day: LIFE magazine's Ralph Morse. Armed with his camera and a case of scotch -- to open doors and loosen tongues -- Morse compiled a quietly intense record of an icon's passing. But aside from one now-famous image (above), the pictures Morse took that day were never published. At the request of Einstein's son, who asked that the family's privacy be respected while they mourned, LIFE decided not to run the full story, and for 55 years Morse's photographs lay unseen and forgotten. "I grabbed my cameras and drove the ninety miles to Princeton," Morse recalls. "Einstein died at the Princeton Hospital, so I headed there first. But it was chaos -- so many journalists, photographers, onlookers milling around outside what, back then, was a really small hospital. 'Forget this,' I said, and headed over to the building where Einstein's office was. On the way there, I stopped and bought a case of scotch. I knew people might be reluctant to talk to me, and I knew that most people were happy to accept a bottle of scotch instead of money if you offered it in exchange for their help. So, I get to the building and nobody's there. 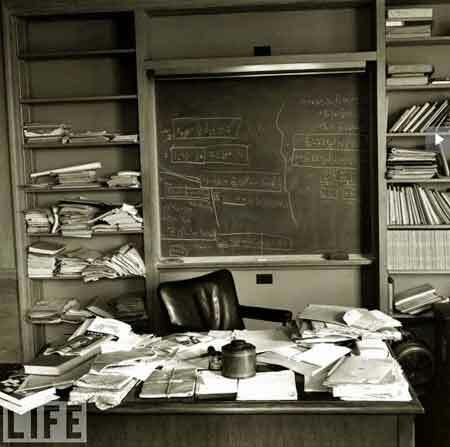 I find the superintendent, give him a fifth of scotch, and he opens up Einstein's office so I can take some photos." 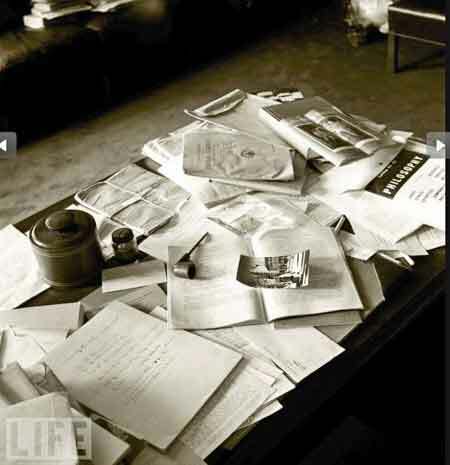 Reminds me of that old adage that goes something like "A cluttered desk is the sign of a clear mind." This page contains a single entry by DaveH published on April 16, 2010 8:45 PM. A good meeting was the previous entry in this blog. Allen West is the next entry in this blog.